I have been publishing content on this blog for over seven years. Until now, I have never featured a "guest" or "guest post". Sure, there may have been links to other awesome content people have created, but nothing like this. It's that good. The author of this case study is my good buddy (and previous cubicle neighbor), Sam Davis. Sam now works for JCJ Architecture. When I got back from RTCNA last year, Sam and I had some lengthy discussions about the announcement of "V-Ray for Revit". He mentioned that he planned on trying it out when he got the link from Chaos Group (getting the download link took forever...). A few weeks had gone by and we didn't discuss it again. 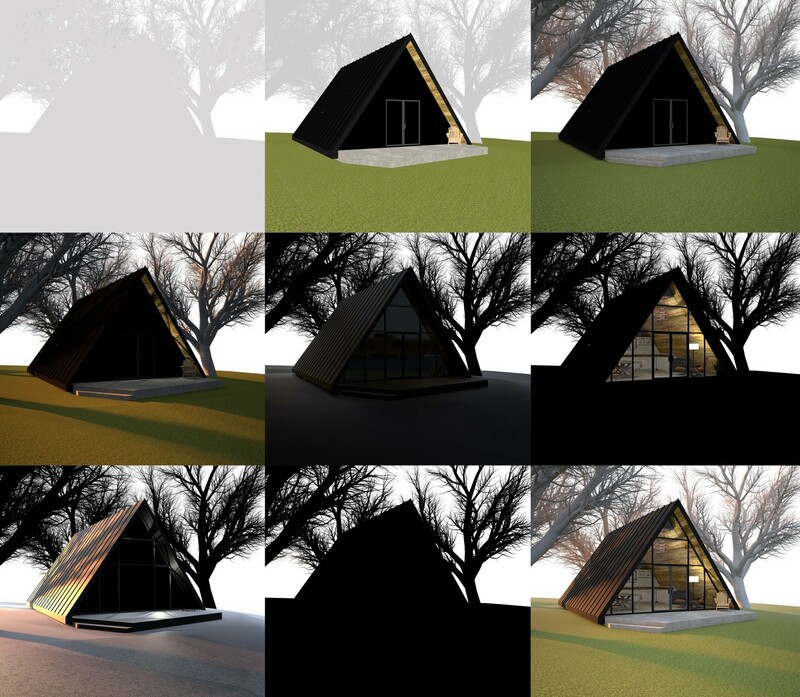 Then, out of nowhere, Sam sends me the first draft of his case study on V-Ray for Revit (Beta). Sam did an excellent job evaluating the beta release, comparing it to current standards, and communicating his findings... Well done, Sam, and thanks for letting me share it with my audience, exclusively. Many visitors of TheRevitKid.com may remember a July article posted by Jeff, which highlighted his eight biggest hits of the Revit Technology Conference of North America. 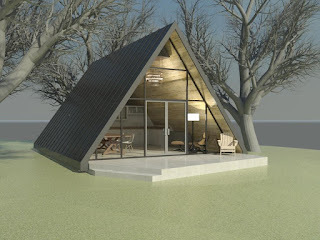 The third notable mention on this list was the release of Chaos Groups’ V-ray rendering engine for the Revit platform. As we all know, keeping up with evolving technology in the AEC industry can prove to be a valuable asset and rendering tends to be an underutilized facet of BIM. One of my responsibilities as a Revit committee member at JCJ architecture is to pay attention to trends in the industry. Keeping our staff informed of new developments in the field is what keeps us on the cutting edge of design and project delivery. Periodically our committee takes a step back to reassess our tools and techniques in a never ending pursuit of architectural excellence. Coincidentally the same week of Jeff’s post we decided to reevaluate our current standard Revit rendering process. The goal of committee members was to try our hands at any new program of our choosing, and use it to create a Revit model rendering workflows that could potentially be used firm-wide. The prime objective of this exercise boiled down a simple 3 point virtue. Whatever program, workflow or method of rendering we tested we were primarily seeking ease of use, high quality product, and large-scale consistency in renderings. Maybe I had a running start on this assignment, because I had worked with V-ray in the past for both Sketchup and 3DS Max. I knew its capabilities, and I knew that it was coming to Revit. 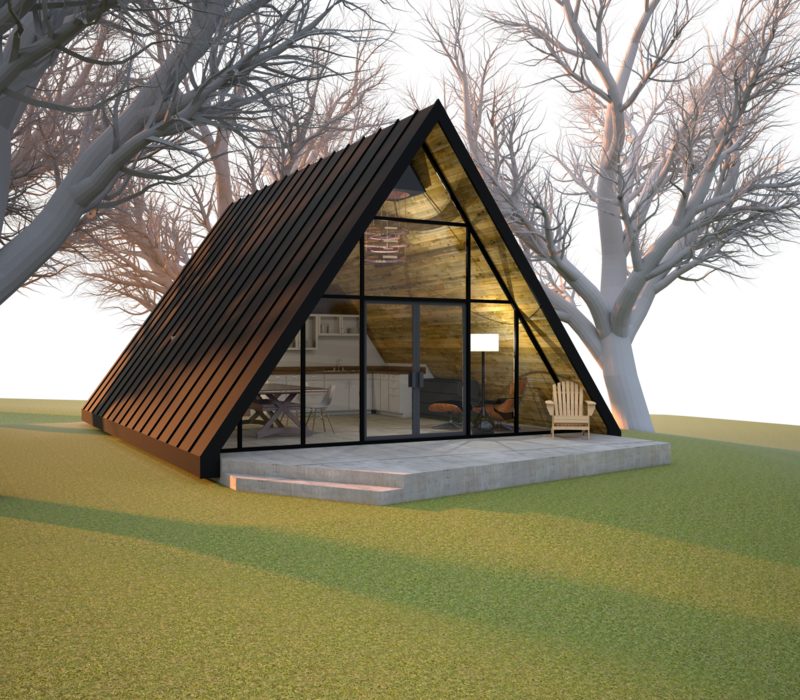 My plan for the project was to link our sample Revit model into 3DS Max and render with my knowledge in V-Ray. At my presentation to the Revit Committee only a few days later I was praised for my V-Ray creation with emphasis on materials, lighting, shadows, and an overall realism when compared to that of my competitor’s. These were in fact some of the strongest attributes V-Ray brought to the table. However, remember that our objective was also large-scale consistency, not just the most impressive rendering. With our attention shifted from initial impressions to ease-of-use and practicality, a different side of V-ray for 3DS Max was eventually revealed. This photogenic image hid a truly cumbersome, bulky, and at times bloated monster. The model was weighed down with families, materials, and data that where non-essential to scene I had created. This resulted in the software slowing beyond means of feasible use. To keep what seemed like a sinking ship afloat, I was forced to clean it out, reapply material (mostly built from scratch), create a new environment, set up new camera angles… and the list goes on. Learning 3DS Max alone would be too much for most to swallow, or even bite off into pieces. On top of all of this, V-Ray’s comprehensive settings require lots of fine tuning. Regardless of its visual strengths, the software simply did not lend itself to creating the consistent product that we were looking for. On the defense of V-ray, the test model I had used for the assignment was intended for a construction project, and not for visualization purposes. Despite the initial reaction of my contemporaries, I never lost hope in V-Ray. If a fully integrated version was introduced (or even possible), all of the shortcomings mentioned above with the Revit to Max workflow would be resolved. This alone kept me anxiously awaiting the V-Ray release. Six months later, I received an email from Chaos Group stating that the Beta version of V-Ray for Revit was now available for testing. Because I had worked with V-Ray earlier and analyzed its strengths and shortcomings, I registered as a tester to see how the software had been adapted to the Revit platform. After spending time working with the Beta, I am excited to share with everyone a full review of V-Ray for Revit. Following an ordinary installation, and opening Revit 2015, you will notice a new V-Ray tab on the ribbon. 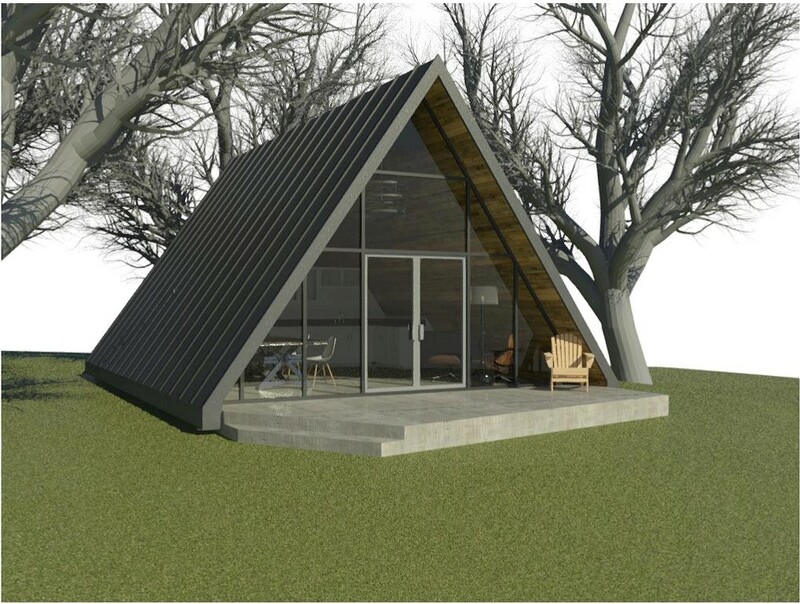 I was pleasantly surprised by the simple layout and straightforward options before me, and it all seemed to integrate seamlessly into the Revit I knew. Below is a brief overview of the controls. The View Panel: Current View allows you to choose what 3D view in the project you would like to render. 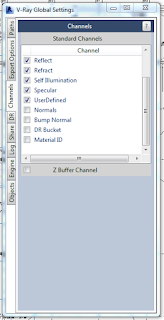 Render Panel: Render With V-Ray initiates the render, and provides options for basic scanline render or Raytrace render. You also have an option for exporting the scene. Within this panel you can prompt the live preview of a rendering in progress by clicking the Show Frame Buffer button. Quality Panel: Pretty straight forward; allows you to increase or decrease the quality of your render. This has a direct effect on render times. Resolution panel: Adjust the resolution of your final render by adjusting its size in pixels. Again this will drastically effect render times; the higher the resolution, the bigger the image the longer the render time. Lighting Panel: There are two buttons here, one allows you to turn artificial lighting on and off the other is for a “dome light” or HDRI environment element. Here you can load HDRI files that are essentially spherical images that wrap your model to give the impression of a real environment. These are particularly useful for creating realistic backdrops and improving the realism of reflections and lighting. Materials Panel: Gone is the overly complex material editor of V-Ray for 3DS Max or Sketchup. In its place is a simple steam-lined material override editor. V-ray for Revit allows you to use Revit’s native materials editor just as you normally would, with the addition of its own editor that piggybacks Revit’s. This allows you to override your Revit materials with materials made and prepackaged for V-ray called “VRmats” (formerly vismats.) 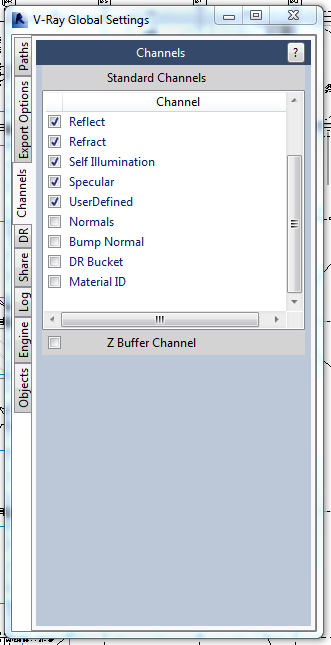 You can also override Revit materials with either a diffuse map or a straight up color. These features show their true value during post processing, but more on that later. Camera panel: Opening the camera allows you to make basic adjustments to how your virtual camera is capturing the image. You can adjust exposure via the many preset conditions labeled numerically 1 through 15 (1 being the darkest and 15 being the lightest.) You can also turn on Depth-of-Field which allows you to edit shutter speed, ISO, F-number, Focal Distance and Subdivisions. Finally you can enable Stereoscopic Rendering which allows you to created renderings for virtual reality use much like Autodesk A360’s stereoscopic engine. Global Panel: This panel contains a single settings button that launches the V-ray global settings window. Here you can control File paths, fine tune your exports, and choose which channels to isolate during a render. There are also options for Distributed Rendering, Sharing Your Rendering, Debug Logs, Rendering Engine Options, and finally Object Settings. I know it sounds like a lot at first but anyone who’s ever used V-ray for other platforms will note that not only have the settings been reduced to the simple necessities but they have been repackaged quite neatly. I was pretty impressed by how well Chaos Group adopted the virtues of the Ribbon. All of this looked extremely promising, but now it was time to see just how V-Ray Stacked up against its native counterparts. For my very first V-Ray for Revit rendering I wanted to do a very fast, super simple, lightweight model; something I could render rapidly. 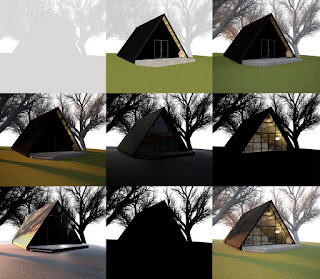 For this case study I wanted to compare V-ray to both of Revit’s native rendering engines, Revit Mental ray and Revit Raytrace. I also wanted to showcase speed and ease of use. I decided to use only Revit’s material editor (with no VRmat overrides) and to try to use V-Ray’s out-of-the-box settings. 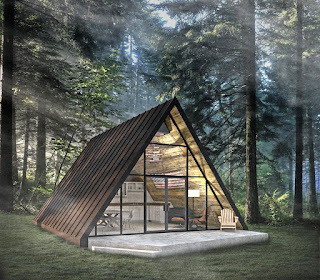 I build a quick scene of an A-frame cabin amongst a few trees. I loaded it up with some prebuilt families, set the tone of the scene and rendered away! Before we get to my results in V-Ray I want to set a baseline for comparison, here are two images of the same exact scene rendered in Mental Ray and Raytracer. While Raytrace is by far the fastest in terms of raw rendering time it captures only Environment lighting and by default shuts off artificial lighting. Shadows are rigid and materials are flat, while it may be a great tool for quick imagery Raytrace really doesn’t hold a flame to V-Ray in terms of sheer power. Here in the Mental Ray render we get a higher resolution image but it has many of the same short comings as Raytrace. Overall the scene lacks contrast and the colors are desaturated. Shadows are hard-edged and the bump maps appear to have little to no effect on material. The interior artificial lights are stark and their rays cast a gaunt light on the walls of the cabin. You may notice that the reflective quality on almost all the materials, notably the grass and concrete. I always add just a little bit of reflection to my materials, I do this because in the real world even matte surfaces reflect a tiny bit of light. While my reflections are set pretty perfectly for rendering in V-Ray here they come on far too strong. 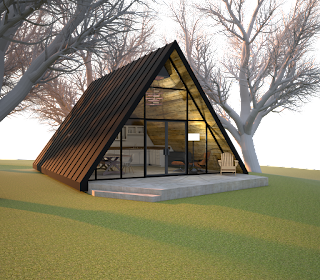 The Image above was the result of my 3rd render after 2 drafts in which I adjusted the Revit camera slightly and bumped up the lighting values. All of my V-Ray camera settings were left alone, and for lighting, I used the built in HDR map in V-Ray’s “Dome Light.” All of my materials were built in Revit and all of my material maps came from Textures.com. I really wanted to put V-Ray’s lighting and shadows to the test so I placed a couple of 3DS trees in the scene. I really appreciate the effect they added, namely shadows but I would never recommend putting such high poly objects into a real project. Speaking of shadows, I was really impressed with what V-ray produced. Shadows produced by the environment lighting looked pretty decent. The shadows cast by the trees and by the house have soft edges and fade to light in a realistic and believable manner, and this drives home visualization of a distant light source. In contrast the artificial lighting in the scene cast harder shadows as the light source is much closer to the object that’s casting the shadow. There are three interior lights within the cabin, all three came directly from Revitcity.com, and my only edit to them a bump in intensity. I really like the warm glow of the incandescence on the heartwood backdrop. Of course, fine tuning of lighting, reflections, bump mapping etc. can all be made in Revit prior to running your final pass of the render, but what happens when you want to tweak something after you’ve spent hours rendering a high-res scene? This is where the power of V-Ray really becomes apparent. V-ray allows you to choose which channels you’d like to render with your scene simultaneously. Using these channels as layers of information in Photoshop you can quickly and easily bump up whatever traits or features of the scene you would like in post processing. This brings me to my next point, the importance of post. 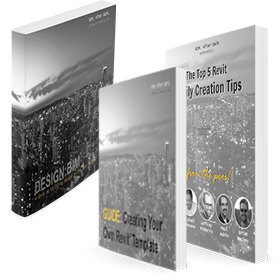 I personally still rely heavily on post processing my imagery from Revit, as it is first and foremost a tool for creating a set of documents and not a bespoke modeling / rendering program. Revit models tend to have a level of rigidity that makes designers cringe. Deep down we all love the contrast of built environment vs. natural environment. Finding a balance to this duality is a noble quest, the search for architectural Zen. Unfortunately the Beta of V-Ray for Revit doesn’t do a whole lot for us in this department, thus post processing would have to get subbed in here in the final period of my case study. In post I replaced the foreground and background of the scene. I also dropped on an HDR filter in an attempt to give the rendering the same effect as an illustration might have. I definitely try to move away from photo-realism in my visualizations, neither my skills nor Revit’s ability are quite at that level yet. Here is my final post processed image; I spent only a 15 to 20 minutes in Photoshop to get this result, again it is important to remember that speed and consistency were major factors in this whole case study. I did not want to spend too much time or do anything to fancy that others wouldn’t be capable of doing. I began this article with an anecdote about my quest for a quick and easy Revit rendering workflow. I am very happy to announce that I found exactly what I was looking in V-Ray for Revit Beta. What we have here is a fully integrated rendering solution that that allows you to take to take a construction grade model and render it to full presentation quality without having to jump through hoops. The user interface is simple, and straightforward. The quality is impressive to say the least, especially for a beta release. The lighting, materials, and camera settings are all improvements over Revit’s native offerings. I am extremely glad to see the HDR environment mapping option as it really does help in achieving more realistic lighting and setting the tone of the scene. I’m also looking forward to playing with the stereoscopic render option, as google cardboard and other cheap VR headsets are becoming more and more popular, this is a topical addition to the program. I’m super impressed by V-Rays integration into the ribbon format, I think Chaos Group really grasped the idea of using it to organize the program and capitalized on how it promotes user accessibility. I think it’s pretty obvious at this point that I’m a big fan of the beta version of V-Ray for Revit, however there are a few major concerns I’d like to voice as well. The first complaint I have is the lack of displacement options for materials. One of the biggest challenges in making a Revit model look realistic is to break the rigidity of the model to make it feel a bit more imperfect. In all of these renders the hard edges and perfectly flat planes make the model scream “CG.” Bump maps, even when cranked to the max, don’t come close to being realistic. The grass in my scene had an incredibly high bump yet it still looks flat in all of the renders. I tried loading a couple VRmat’s from Vismats.com but none of them seemed to have any notion of realistic displacement. I am hoping that Chaos Group will include a displacement map option of some kind in future releases. Perhaps it could be integrated into the VRmat materials or as an override option for Revit. Additionally, I would love to see V-Ray grass included as well. My second issue is with the HDRI Dome light. I need to see more options that give the user greater control of the HDRI image. In my test the HDRI image was way out of scale and came off as a super low-res backdrop to my scene. Controlling rotation, size and scale of the map would have allowed me to keep the background of the scene rather than crop it out with an alpha channel and replace it in post. Aside from those two issues my only other concerns where minor, many of which will probably be worked out by the time the program is released for resale. There may be other shortcomings that I didn’t run into in my brief foray into the program; conversely there may be solutions to these problems that I was unable to find. Either way I wanted to write this article to share my initial impressions of a program I have eagerly awaited for a very long time. I hope it can become a topic of discussion for those brave pioneers of the beta test! Happy exploring guys, if any of you have tips, tricks or methods of capitalizing of the capabilities of V-Ray for Revit I’d love to hear them! If you enjoyed Sam's article above then you will definitely enjoy BIM After Dark - Volume 1. The full length tutorial series is filled with tips about enhancing your presentations.